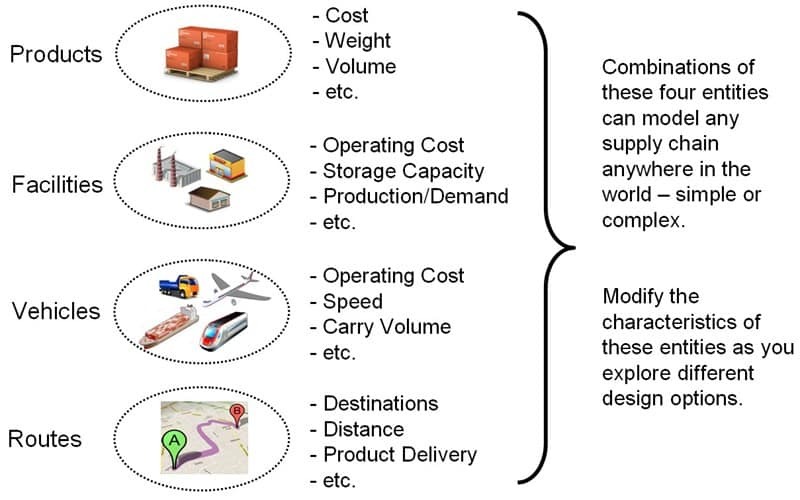 Supply chain models and simulations in SCM Globe are composed of just four entities: PRODUCTS; FACILITIES; VEHICLES; ROUTES. These entities relate to each other and their interactions are what drive supply operations and produce the simulation results. Start a supply chain model by going to the EDIT screen and defining the PRODUCTS in the supply chain. Then define the FACILITIES where products are made, stored, sold or consumed. And finish the model by defining the VEHICLES and ROUTES that move products between facilities to meet demand. Once you define these entities in your supply chain and place them on the map, then click the “Simulation” button on the Edit screen. This opens a second browser tab with the Simulate screen showing your supply chain model. Click the “Play” button on the Simulate screen and it will run a simulation of your supply chain and show you how well it works.